Amazing alliums are just the ticket when livening up sunny spots in the summer landscape. 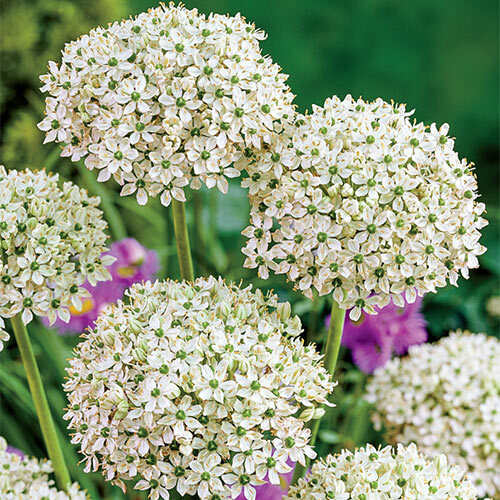 Allium nigrum, features highly distinctive bloom clusters of white flowers with deep green eyes. Each well-formed 5.5-6" orb sits atop a sturdy, 24-32" stem that makes a wonderful showing in borders, beds and bouquets. Site them in full sun and well-drained soil and they'll reward the happy homeowners with plenty of dependably showy blooms that are quite unique. Alliums are tolerant of many soil types, resistant to deer and easy to grow. They naturalize nicely, reliably reappearing year after year with renewed vigor. The flowers are a favorite of pollinators. Not available in ID, WA.